Visual perception of facial age is related to instant recognition of changes in shape, texture, and coloration that evolve as a face ages. There is significant loss of bone, especially around orbits, mid-face, and lower jaw. As the face ages; the orbits enlarge, “cheek bones” shrink and flattens, and lower jaw retracts. This combined with loss of subcutaneous facial fat results in “deflation”, which creates an apparent excess of skin, which wrinkles and sags due to gravity. The skin it-self also deteriorates in several ways: collagen and elastin (structural proteins) are diminished, causing a loss of resiliency. Also, skin loses its uniform color with age: brown pigment spots appear as melanin collections emerge due to sun exposure (sun spots or age spots), unwanted and unsightly surface blood vessels appear due to environmental exposures, unwanted hair may appear due to hormonal effects over time, and scars may further mar the surface. 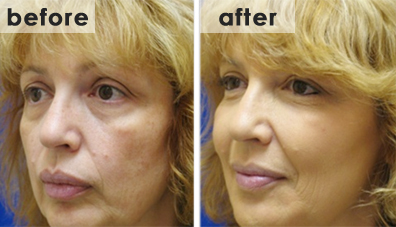 Facial rejuvenation refers to procedures designed to restore the appearance of a younger age to the face. Many procedures exist, both surgical and non-surgical. Botox injections to get rid of wrinkles by relaxing the muscles. 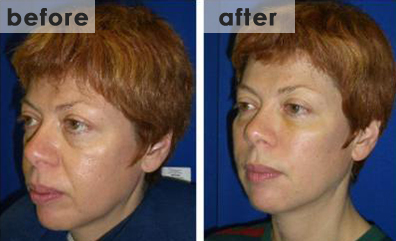 Soft tissue fillers (Restylane, Juvederm, Radiesse, and other) used to restore facial geometry to a younger shape, counteracting effects of deflation. Ultrasound therapy – Ultherapy – stimulates collagen production by going deep into the skin layers without harming the upper layers resulting in facial and neck tightening. Laser and light procedures for improving skin texture, tone, and color, tightening pores, removing unwanted vessels and hair. Chemical peel procedures for improving skin texture, tone, and color, tightening pores, and further stimulating collagen synthesis. Radiofrequency procedures for stimulating collagen production, and resulting in skin tightening and decrease in pore size. Skin care products that augment and maintain effects of the various procedures, as well as nourish and stimulate the skin. Book a free consultation today. Call us at 604-284-5501 if you have any questions. Our friendly trained staff will help you every step of the way.ay.